This book shows, in detail and with concrete examples, how educational theory and research can be translated into practice. Well-known researchers who have worked to establish productive, sustainable connections between the knowledge produced by the research community and the practices employed in school settings provide descriptions of successful strategies that have been used to bridge the gap among theory, research, and practice. *exploration of how different models of intelligence and creativity have informed educational practice. Viewed as a collective effort to translate theory and research into educational practice, the interventions and programs described by the contributors to this volume represent nearly 200 years of work. As a compendium of successful strategies, this book will help others identify ways to make their own research more useful to their practice communities. As an investigation of persistent, seemingly intractable problems encountered when attempting to connect theory and research to the everyday work of teachers and students in classrooms, the analyses presented in this volume demonstrate where additional work is needed. By examining critical, persistent challenges encountered when attempting to connect educational theory and research to the everyday work of teachers in classrooms and schools, this book will help improve the practical value of educational research and help chart the course for future research. 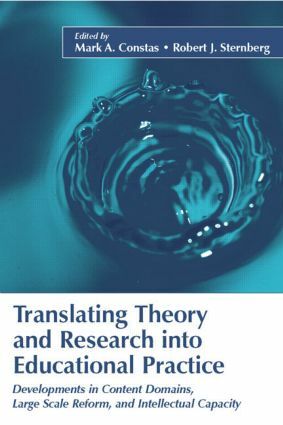 Translating Theory and Research into Educational Practice is intended as a text for advanced undergraduate and graduate courses across the discipline of education and should be particularly relevant for classes dealing with educational research, educational policy, and teaching and learning. The book is equally relevant for various communities interested in improving connections between research and practice, including educational researchers, educational psychologists, psychologists, teachers, other educational professionals such as state school officers, district officials, and policy makers. The authors' comprehensive descriptions and critical reflections will provide readers with valuable insights about the practical demands, theoretical complexities, and political realties associated with efforts to translate theory and research into effective educational practice.